As part of the OpenNTF development contest sponsored by hedersoft, Jesse Gallagher has contributed a project called Forms 'n' Views which is a web based XPages application allowing users to change design elements like views, forms, folders and stylesheets. Forms 'n' Views is intended to be something of a "Designer Lite" for the web - a tool for making quick changes to legacy design elements without loading Designer. Currently, it can be used for basic Form, View, Folder, and Style Sheet modification and (save forms, for now) creation. 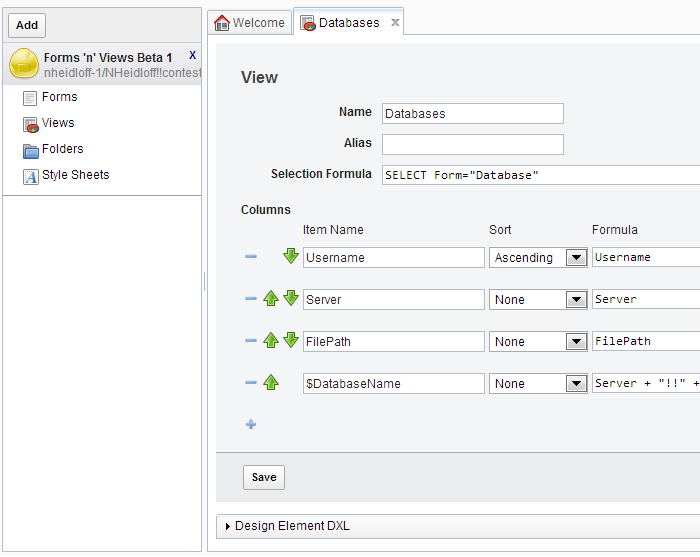 In the cases of Forms, Views, and Folders, the editor UI is geared towards working with the data structure and not the UI - in this sense, it is useful as a support tool for an XPage-focused database, where the appearance of the design elements in the classic client isn't important (though it could be used to modify existing elements without destroying the appearance). All design-element manipulation is done by manipulating the DXL representations of the notes. This means that existing information is generally preserved, barring any corrupting edge cases.